Posts related to game development. I really haven’t done any development for Resistor in over a month, so I decided to go ahead and put it into the Peer Review process on the Microsoft Creator’s Club site. I see it as my way of doing my part in adding to the fine collection of interactive video entertainment titles in the XBox Indie Games marketplace. With over 400 entries into the Dream Build Play competition, I don’t think I have a chance at being one of the finalists. If the competition was based purely on uniqueness I think my game would fare better. However as in real life, looks do matter and my game is about as plain as it gets. Overall, I would be thrilled if my game could make $100 on the marketplace, which would equal the original investment that I made for the Creator’s Club membership. Unfortunately, I’ve heard that most XBLIGs don’t make anything, so my goal is probably a bit of a stretch. Below are the changes I made to the game after putting it through playtest a few weeks ago. Tutorial tips were added to teach new players the rules of the games. These tips should not display as long as the player is doing well in the game. The tutorial tip system keeps track of which tutorial tips the player has seen, and it doesn’t display a tip that the player has already seen. However, once the player quits the game the tip flags are reset. 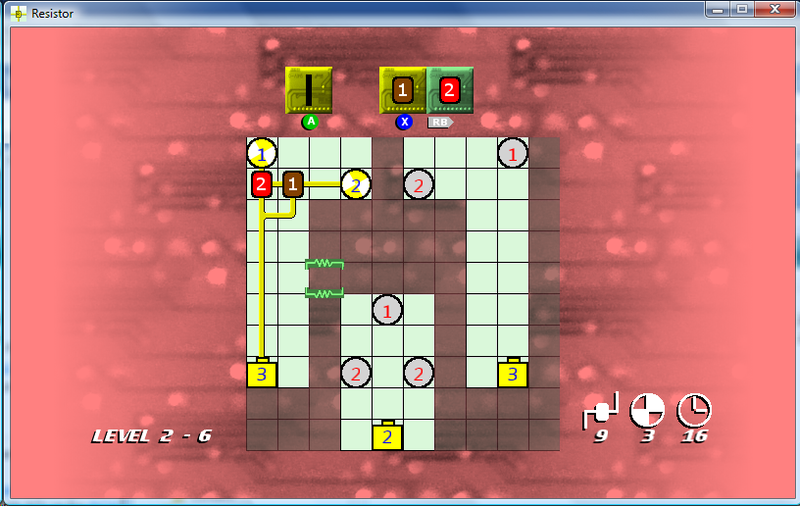 A tip is displayed if the player falls to the B rank in any of the three categories. Also, if the player doesn’t use the appropriate resistor and gets a Game Over, then a tip will display when the level is started again stating that resistors should be used to reduce the flow value. Made the spinning light sprite display while the LEDs are filling, using the scale parameter. The rank letters at the end of the stage now zoom into position. Changed the A, B, and C rank colors to use lighter shades of blue, green, and red. The status icons in the lower right portion of the screen now change with their respective rank values. I also modified the real time rank value of the luminosity category, so that it calculates the rank based upon the maximum possible luminosity of activated LEDs (instead of all LEDs). 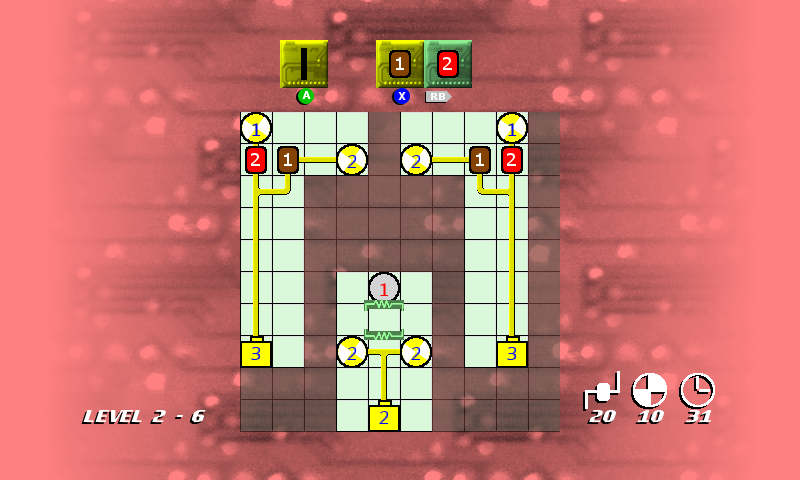 This way, the player starts out with an S rank in luminosity and the rank is only lowered if they connect a wire with a lower flow needed by the LED. Used Audacity to make the ding sound when an LED is activated lower based on the difference between the maximum flow value and the current flow value. The rank grades at the end of the stages use these modified sounds as well. Another problem that I noticed during the playtest session was that there was not a clear correlation to the player between what they were doing in the level and the rank grades after the level was completed. Therefore, I added three icons to the lower right portion of the screen, and numbers signifying the values for those categories which update in real time. I thought that adding this would make the screen have “too much going on”, but I will leave it in for now. I also put those icons next to the textual descriptions on the level complete screen, so that there is a direction connection between the icons on the game level screen and the categories on the level complete screen. I also tried coloring the icons in real time based on the current rank value for each category. However, this was confusing because pieces and time would start out yellow (S-rank) and luminosity would start out red (C-rank). This is because the player raises their luminosity rank over time, and the player can only lower their piece and time rank over time. Plus, the colors would sometimes change and flicker too quickly between grade colors at times. Therefore, I left all of the icons and numeric values white. There is a visual connection problem that only occurs when placing a resistor next to two objects, where one of the objects in another resistor. 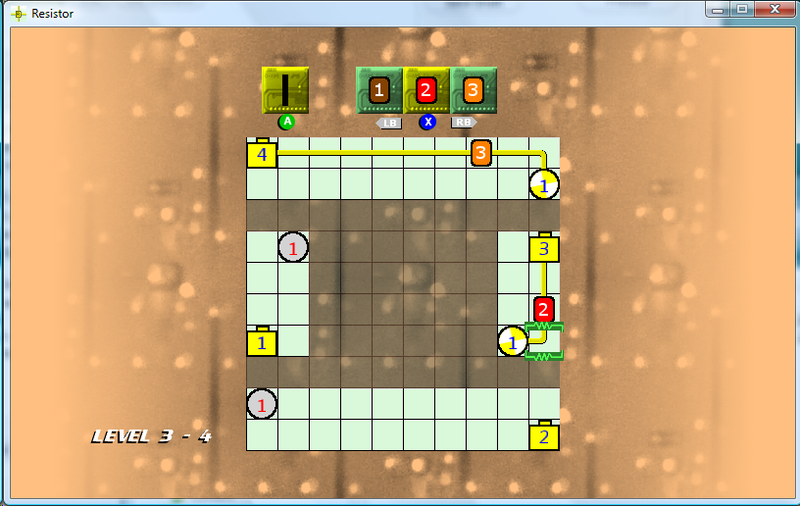 This is apparent on level 2-6, where you have to put a 1 resistor next to both a wire and a level 2 resistor to get the maximum luminosity of 2, as shown in the screenshot below. Notice the connection between the 2 and 1 resistors, which really doesn’t exist when looking at the flow values, but it is incorrectly drawn. Displaying the flow values shows that the resistor’s value is automatically deducted from the flow value. I rewrote most of the code in the method which returns the wire image used for a specified cell. This code is used for both the wire and the resistors, since the resistor is overlayed on top of a wire image. First I load four variables containing references to each of the four adjacent pieces (or null if one doesn’t exist). Then I start assigning null to those variables if a connection to that adjacent cell should not be made. Finally, I have an if/then statement which looks at those values and then returns an integer ID representing the wire image to use to make the appropriate connections. I started seeing the one frame flicker problem again, when a new piece was placed next to more than one adjacent pieces. I found that the line of code that placed a new piece on the board was located after the code which updated all of the pieces. Therefore, the first frame of a new piece was always incorrect. I moved the line of code which adds the new piece above the piece array update check, and now the flicker problem is no more. For each piece, if it is not filled or filling, then it should make all possible connections because there is no way to tell which direction the flow will be coming from. 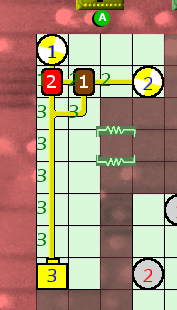 If there is an adjacent cell, it should make a connection to that cell if the flow direction (stored as an instance variable of the GamePiece) is coming from that direction. Conversely, a connection should be made to any adjacent cells which have flow coming from the current cell. Otherwise, a connection should not be made to the adjacent cell, because it could possibly have a different flow value. One continuous wire should not have two different flow values, which I explained in an earlier post. Below is what the corrected display looks like now. A lot of work to fix a small graphical anomaly which nobody would have probably ever noticed anyway. Additionally, I updated the code so that the luminosity icon value only increments after the LED fills (not as it starts filling). Attended the Knoxville Game Design meeting at The Technology Cooperative and received a lot of good feedback from fellow developers. 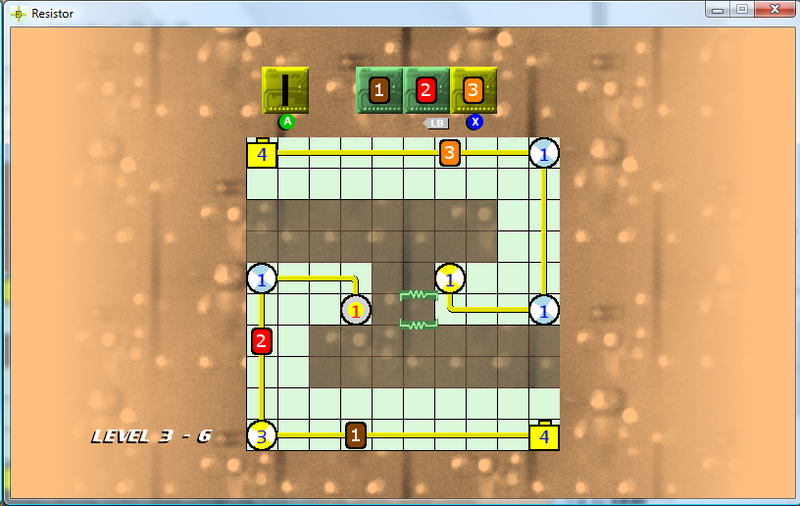 The guys at Chaosoft were particularly helpful with their suggestions to improve controls and gameplay. It was my first time seeing other people play the game, and served as a good informal cognitive walkthrough. A couple of gamers tried out my game, and it was quickly obvious that the game wasn’t clear about which buttons perform which actions. In the old days we had instruction manuals that told us the controls, but it was usually faster to figure out the controls than looking it up in the manual. With digital distribution, we no longer have the luxury of providing the player with a hard copy manual, so all of the control explanations have to be built into the game. Also, back in the NES days we only had 4 buttons and a D-pad, so figuring out the controls was a lot simpler back then. One helpful suggestion was to put the wire on its own button. This was an obvious control improvement, and I couldn’t believe I hadn’t implemented that earlier. The wire is used much more often than the resistors, so it clearly warrants having its own button. Separating this functionality took a little bit of time, but it was worth it. A graphical “A” button has been added below the wire selector, and a graphical “X” button has been added below the currently selected resistor. The animated arrow which previously pointed to the selected component has been removed. This makes it clear which buttons perform which actions. I also added “LB” and “RB” labels next to the “X” graphic. “LB” only displays if the selected resistor is greater than one, and “RB” only displays if the selected resistor is less than the maximum (however you can still press those buttons to make the selection loop around). There was still some confusion about hooking up a resistor with a lower flow value than the LED, so I may have to add some more explanation about the rankings, especially the “luminosity” ranking. Another suggestion was to display a timer on the game level screen, so there was an indication of how well you are doing in respect to the time rank. I’ll see if I can work that in, but I think it may make it appear as “too much stuff going on” in the game screen. The screenshots below show the new button displays, as well as the new blue color if the LED wasn’t connected with it’s maximum flow value. I chose blue because it is a cold color, and it was different than the default “off” gray color of the LED.